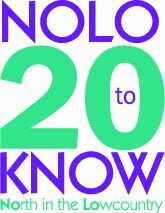 Come to the 20 to Know reception at the Fire Museum in North Charleston to celebrate NOLO's top 20 honorees this year! The reception is a wonderful opportunity to network with honorees, and other members of the community. This celebration will include hors d'oeuvres, beer, wine and great company.